Every United States citizen and temporary working resident is issued a nine-digit Social Security number from the Social Security Administration. The primary purpose of these cards is to track people for Social Security purposes. Social Security numbers have been issued since the New Deal established the Social Security Program in 1935. As a part of the program, the Social Security Administration issues Social Security cards to citizens and temporary working residents that have their Social Security numbers on them. While this is an effective way to distribute Social Security numbers, many people unfortunately lose their Social Security cards. This can create a lot of headaches and presents the opportunity for identity thefts to steal key personal information. Social Security cards are also frequently damaged by coffee spills, accidental ripping, etc. which also creates problems. The benefit of storing your card in a plastic bag or plastic container is that doing so will protect it from liquids. So, you won’t have to worry about accidentally ruining your card by spilling coffee on it. Waterproof storage can be very helpful for protecting your social security card for the long-run. Your Social Security card should be stored somewhere safe in your house where you will know where it is at all times. If you have a safe, or a filing cabinet for important documents, then store it there. If you keep it in your wallet, then it is much easier to lose. 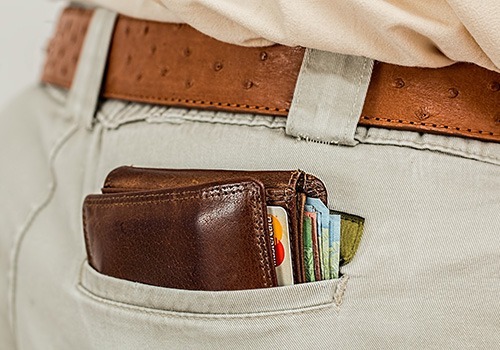 Wallets are also prime targets for pickpockets and thieves. So, do not store it in your wallet. Just keep it somewhere safe in your home where you will never forget where it is. If something goes wrong and you can't find your card, follow our steps regarding what to do if you lose your social security card. Social security cards have to be taken out from time to time. This is because various employers, government agencies and other entities will require it for verification purposes. But, the best way to prevent losing it is to immediately return it to your safe, filing cabinet, or other storage area where you normally keep your card. The longer that you leave your card out of your storage area, the more likely you will be to lose it. So just return it as soon as you are done using it. Can You Laminate Your Social Security Card? Many people wonder if they can laminate their Social Security card, because they believe that laminating it will help to preserve it for long-term storage and protect it from water damage and general wear and tear. However, while it would seem like a good idea to laminate your Social Security Card, the Social Security Administration actually advises people not to laminate their cards. This because there are a number of security features built into Social Security cards that can be ruined through lamination. But, the Social Security Administration does recommend putting it in a sealed Ziplock bag, or other plastic container that can be easily removed. This will help keep it from being damaged and help keep you from requiring a replacement social security card. Proper storage of Social Security cards is important to prevent theft, loss, and damage. The absolute best way to store your Social Security Card is to put it in a waterproof plastic container and to put it inside of your safe, filing cabinet, or other storage area. If you can do this, then you will most likely be able to keep your Social Security card protected for many years.